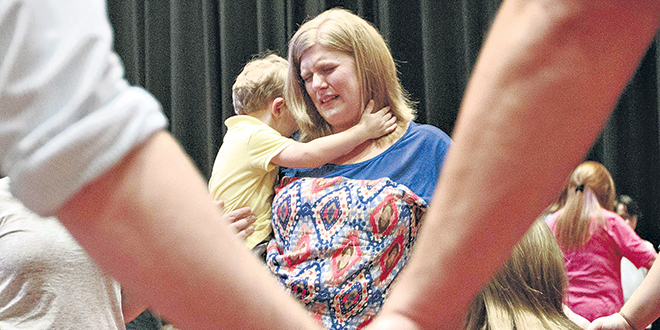 Shooting: A woman grieves while holding her son during a July 16 prayer vigil at Redemption Point Church in Chattanooga, Tennessee, for victims of a deadly shooting spree at two military offices in Chattanooga. The shooter, Mohammad Youssuf Abdulazeez, 24, was killed by police gunfire after he fatally shot four US Marines and wounded three more people at two military offices that day in Chattanooga. AN outpouring of sympathy and prayer washed over Tennessee for the victims of a July 16 shootings that left four Marines and the shooter dead. Bishop Richard Stika of Knoxville, whose diocese includes Chattanooga, encouraged all Catholics and people of faith to participate in a community prayer service at the Basilica of Saints Peter and Paul in Chattanooga held the afternoon of the shootings at a military recruiting centre and a Navy-Marine training centre a few kilometres away. “Our community is deeply saddened by the tragic loss of four United States Marines in this senseless act of violence,” a statement from Bishop Stika said. “I have two brothers who served in the US Marine Corps and I recognise and appreciate the selfless service all members of the military give to protect us. Pastor of the Basilica of Sts Peter and Paul Fr David Carter led the prayer service for all the victims of the incident, including Muhammad Youssef Abdulazeez, 24, of Hixson, Tennessee, who was identified by law enforcement authorities as the gunman, and three people who were wounded in the attack. Tennessee news reports identified the four murdered Marines as Gunnery Sergeant Thomas J. Sullivan, 40; Lance Corporal Skip Wells, 21; Staff Sergeant David Wyatt and Sergeant Carson Holmquist. Abdulazeez was shot to death by police, The Associated Press reported. Fr Carter said about 50 people attended the prayer service. He said they were seeking solace and guidance in dealing with the situation. It was a sobering, sombre experience, he said, that changed into one of hope “as we invited God to help us make sense of this situation”. “We’re all shocked by the shooting. We didn’t expect it to happen in Chattanooga, this close to home. I have parishioners who went to high school with the young man identified as the assailant,” Fr Carter told The East Tennessee Catholic, newspaper of the Knoxville diocese. “We’re saddened that our city had to experience such violence, but we have a way of uniquely responding to this situation. “We’re responding with hope and the belief that we play a part in making the world a better place. 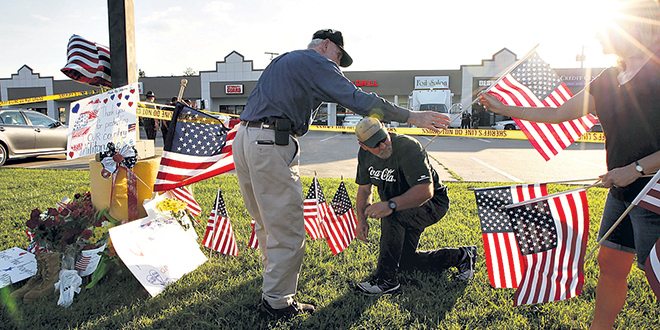 Prayers for victims: Mourners place flags at a makeshift memorial for shooting victims in front of the Armed Forces Career Centre in Chattanooga. In a statement, president of the Islamic Society of Greater Chattanooga Bassam Issa said that in his community, “our hearts are with the families of the brave Marines who died today and with the police officer and two bystanders who were shot and injured in this cowardly act. “We condemn this act in the strongest possible terms as one of cowardice and hate. At the Islamic Society of Greater Chattanooga, we don’t see our community centre as a ‘Muslim’ community; we are Chattanoogans first, and we see ourselves as part of the larger community of Tennesseans grieving today’s act,” he said.